A simple question, but I can't find the answer. 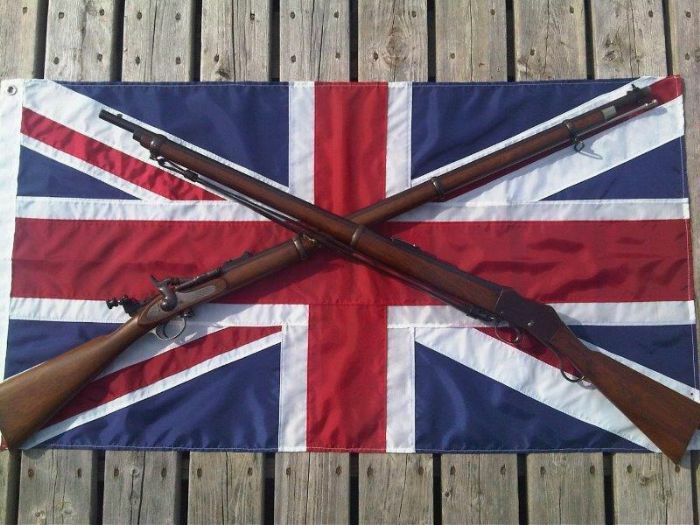 When did the british army changed the brass weight pull through for the one with the steel weight? Which one fits my 1943 Maltby? it came with a mk4 brass oil bottle from W.H.B. I don't know I've never head of, or ever even seen a picture of one till, now. Are you sure its an Enfield pull through? 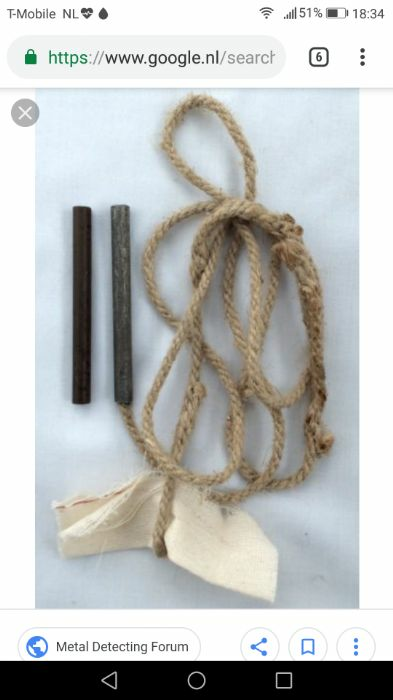 I am sure it's the same rope only now there is a steel weight crimped on the rope. It may also be some one off in the field thing. I've done the same got the rope then made a weight & fitted it, only I used a piece of copper pipe. When a bore brush is past it's best I used to use the brass end to make a pull through. Now I don't bother as 'Bore snakes are so cheap on e-bay. Maybe it is a reproduction or something made in the field I dont now. But I did a little search on google images and you can find some more steel ones. Its a Henfield, never say never! Please excuse: I am an ( Enfield ) beginner! What´s on the other end of the pull through? A thread? Which size? ( I suppose NOT 8 - 32 or 8 - 64, and NOT 4 mm, which is fine in European Militaries ) or a loop? And what´s the brass loop? Where to attach this? And the metal part with 4 points - is that a firing pin tool? Is this necessary, or just nice to have? The firing pin tool isn't necessary if the rifle is correctly set up, but nice to have if it's not. The Lee-Enfield has fairly lax tolerances on firing pin protrusion, but you can puncture primers if it's outside the desired range. They're not terribly expensive. I think my reproduction tool cost about $20 off ebay. 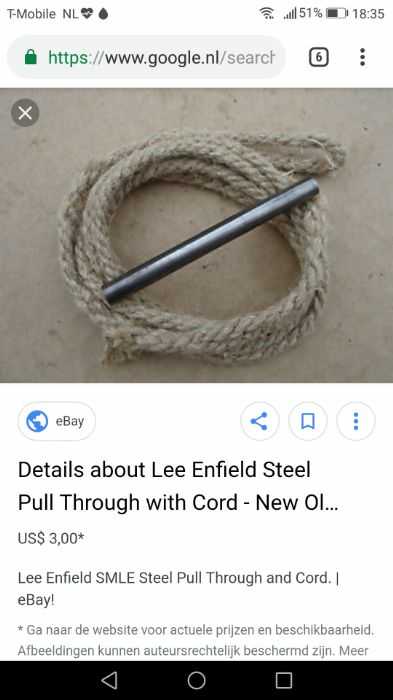 just a couple of loops of the cord. what you do is tear off a strip of "2X4" (the rolled fabric with the red lines) & make a "patch" which your partner will pull through the bore. 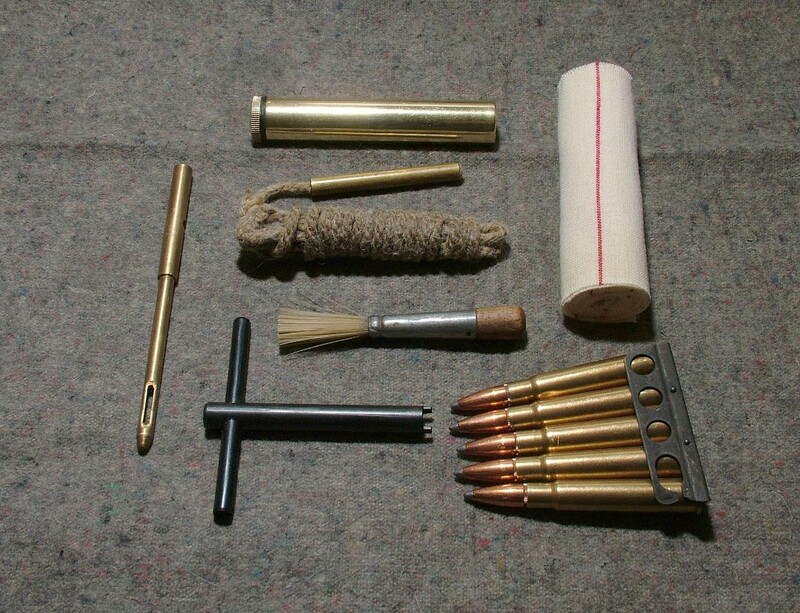 The could be whetted with a soluble oil bore cleaner which was the military version of "Young's .303" or run dry. I'm not sure I understand what the "Metal part with 4 points" or the "brass loop" are, can you post a pic? 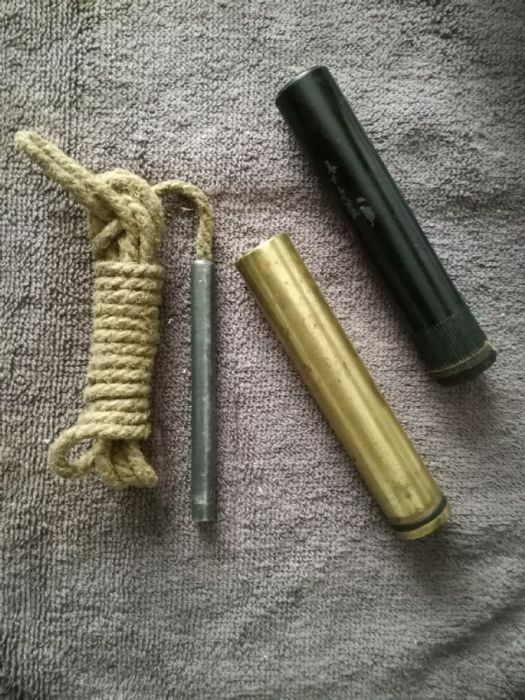 Steel pull through weight was a WWII war expedient, brass was diverted towards ammunition casing manufacture. Also, oiler bottles were produced using a plastic type material to conserve brass. 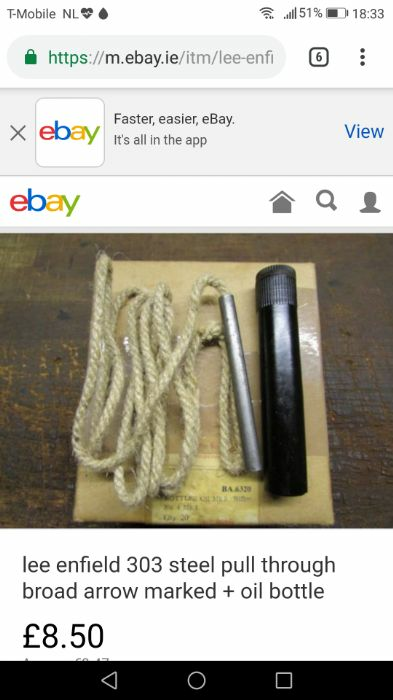 So a steel weight pull through with plastic oiler would be good in a 1943 rifle. I referred to the first pic in the thread. 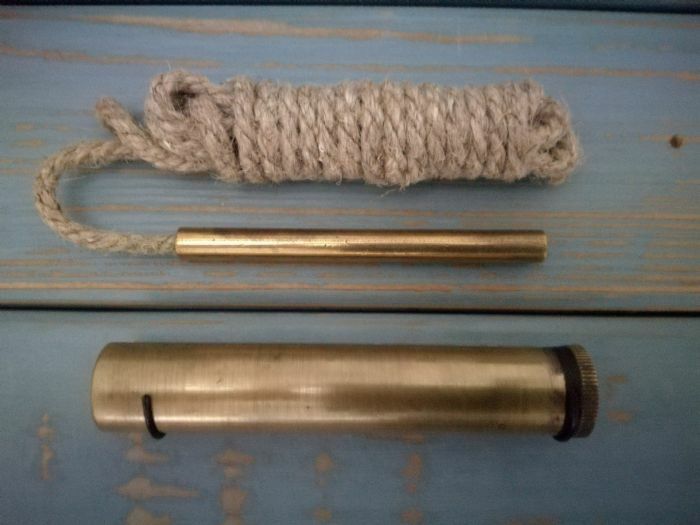 Piece of brass with loop on the end, and "4 pointed thing" , I think it´s the FP tool. “4 pointed thing” is actually a “2 pointed thing”, you are seeing the shadow from the two lugs in the end of the tool making it appear to have 4 points. It’s a tool to remove the striker from the bolt.